25 comfortable rooms: double, triple and family rooms for four persons - two separated rooms with private bathroom with bath and shower, hairdryer , toilet, telephone and television. A majority of our rooms have a balcony facing the surrounding peaks , overlooking the valley and the slopes. A restaurant ... two spaces in a warm mountain style setting also open to the customers outside the hotel. 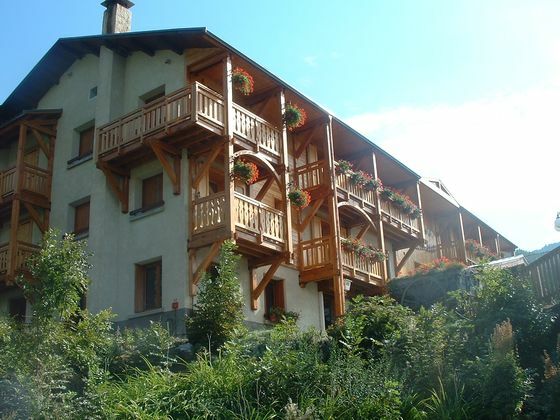 But ... it is also the apartments (4 to 7 persons) , comfortable, in the chalet with balcony facing the slopes . Possibility of traditional holiday rental by week, or rental with hotel service. Half board in any period , full board or B & B (depending on season) for individuals clients, families and groups (on the request). The breakfast is served in buffet or in your room or on the terrace in summer. … private access ... on reservation , with sauna and jacuzzi , will be, after your ski day, the ideal place for a moment of " well-being ".